Whew, our luggage scale was definitely a worthwhile investment. My checked bag weighed in at 48.5 pounds on the JetBlue scale, almost identical to the reading I got at home. (I left a little cushion, to allow for calibration differences.) 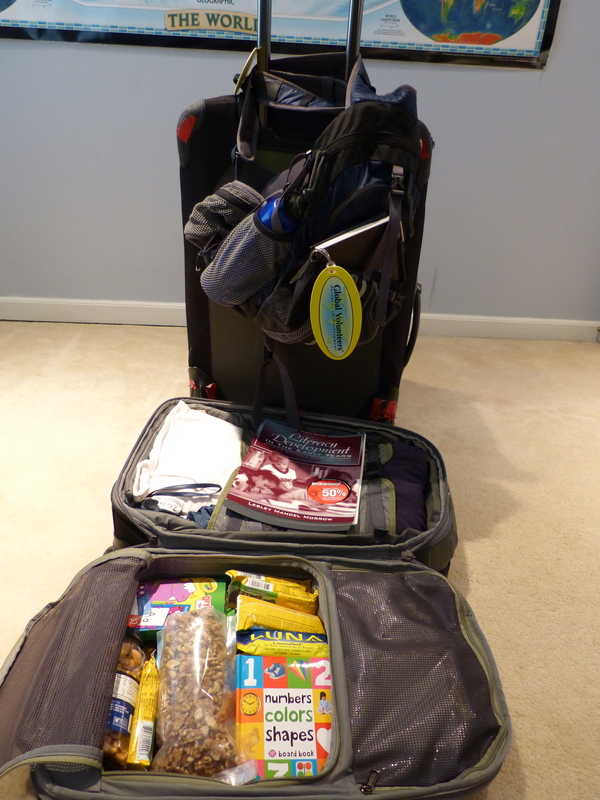 So, between my checked luggage and my carry on bag, I am tipping the scales at 74 lbs…not counting my back pack. I have never even come close to the weight limit on ANY trip, even when we had to bring clothes for two climates. As you can see, I DID squeeze some clothes into my carry on. Fortunately, while I was still in the packing stage, I connected with Michelle and Paddy, two incredible women who were members of the first team assigned to the Kiddie Homey Day Care Center. They clued me into the cheap laundry facilities at the hotel, which meant I could bring fewer clothes and more supplies. I also stocked up on protein snacks to supplement the box lunches I’ll be getting, and stuck in an umbrella (for the frequent, brief surprise downpours). Thanks to them, I feel prepared–at least when it comes to packing! I was not thrilled about flying out of JFK, because the trip from central Jersey to that airport is normally rather arduous. What a pleasant surprise to get from my garage to the gate in an hour and a half! That includes going through bag drop and security. Of course, leaving the house at 6:15 AM on a Saturday might have SOMETHING to do with it, but if Mike has an easy drive back home, and if fetching me on a Saturday night goes as smoothly, then JFK will definitely be a future travel option. The jet blue terminal is beautiful and well designed. I love the free wi-fi, which is something that Newark airport lacks.